Were the members of the legendary musical group Bon Jovi medical visionaries? How else do you explain Shot to the Heart? This prophetic song predicted the protective benefits of the flu shot against heart disease more than 30 years before researchers would arrive at the same conclusion. Earlier in 2018, researchers from the University of Toronto published a ground-breaking study in the New England Journal of Medicine linking heart attacks and influenza. The study by Dr. Jeffrey Kwong and colleagues examined almost 20,000 patients who tested positive for influenza. They discovered that the risk of a heart attack increases 600 per cent within a week of influenza infection. While the risk increased with other respiratory infections, influenza caused the greatest increase. As a molecular cardiologist, my research focuses on developing new treatments for heart attacks. The discovery that influenza is such a powerful risk for heart attacks presents researchers and health-care professionals with a new challenge in dealing with patients who have heart disease. With influenza rearing its ugly head every year, what can be done to protect the heart? It turns out something as simple as the flu vaccine may provide a protective "shot to the heart." Investigators from the National Institute of Infectious Diseases and Vaccinology in Taiwan examined the medical records of 80,000 elderly patients over 13 years. This study found that an annual influenza vaccination decreased the risk of a heart attack by 20 per cent and offered similar protection against strokes. The flu shot doesn't just decrease the risk of heart attacks. It also protects patients who already have heart disease. In a study from The George Institute for Global Health at University of Oxford, the health records of 59,202 heart failure patients were examined. 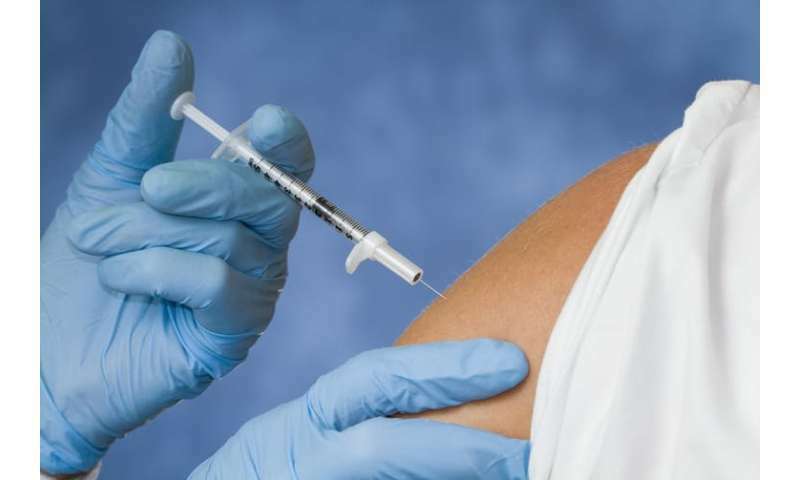 Researchers found that patients who were vaccinated against influenza were 27 per cent less likely to be hospitalized for heart failure complications. Unlike most vaccinations that target one type of infection, there are many strains or types of influenza. Each year scientists predict what type will be most common and recommend an annual vaccination against that strain. The uncertainty about which type of influenza will dominate means the vaccine is not always highly effective. On average, the effectiveness of the annual influenza vaccine is 50 to 70 per cent. Interestingly, even when influenza vaccinations are not 100 per cent effective against the flu, they still provide protection against heart disease. One study shows that patients whose vaccination failed to prevent an influenza-like illness had lower rates of cardiovascular events compared to people who were not vaccinated. Similarly, a 2017 study by published in the journal Clinical Infectious Diseases reported that even when influenza vaccination fails to prevent the flu, the severity of the infection is less and there are fewer complications. The health benefits of the flu shot are clear and widely supported by research. Most countries recommend annual influenza vaccinations, especially for high-risk groups like seniors, children under five years of age and people with chronic medical conditions like heart disease. Canada has set a target of 80 per cent influenza vaccination coverage for seniors with chronic medical conditions. According to Statistics Canada, 32 per cent of seniors in this group received a flu shot in 2013-2014. In Europe, fewer than half of people in high-risk groups receive a flu shot and similarly low rates are reported in the United States and Australia. Why are influenza vaccination rates so low? The propagation of myths and misconceptions about the risks and benefits of vaccination through social media is a significant driver. Misinformation about the flu shot is increasingly causing people to question its value. Additionally, people in low-risk groups may decline to get a flu shot because of a sense of invulnerability. While it's true that healthy people are at low risk for complications from influenza, declining vaccination puts others at risk. Healthy people who are not vaccinated increase the chances of contracting the flu and passing it along to high-risk individuals. Vaccination of healthy, low-risk individuals is crucial to maintaining the health of the general population, a phenomenon called "herd immunity." This flu season, roll up your sleeve and get a flu shot. Do it for your heart. Bon Jovi would tell you that anything else is just Bad Medicine.